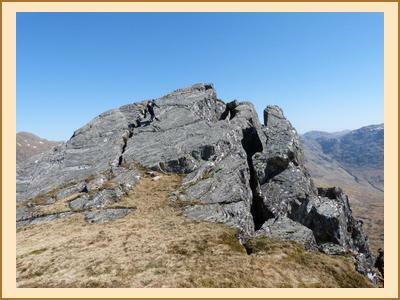 If the EMC had any "bad weather karma" banked after the winter season's storm-wracked meets, sorry, we've just blown all our accumulated credit on several days of glorious weather in Knoydart. Amazingly, everyone made the boat at the appointed time (5pm), although some consternation was caused to late departers by heavy traffic around Perth, and then comments from the operator that we'd we wading from the landing spot if we didn't leave earlier than originally planned. As it turned out the tide was nowhere near in, and the superbly located Rayburn-warmed White House was occupied without incident well before generator cranking time. 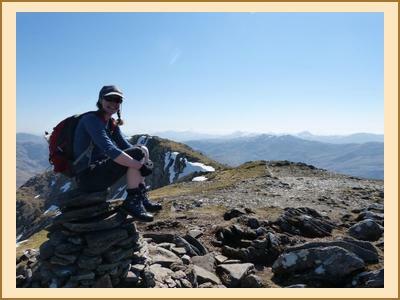 "In Spring, a young man's fancy lightly turns to thoughts of..." bagging as many Knoydart Munros and Corbetts as possible, of course. A gorgeous Saturday morning saw a two-pronged mass assault on Ladhar Beinn and it's spectacular northern Coire Dhorrcaill, with a big party going clockwise over the Stob a'Chearcaill scramble, and Martin, Tim and Ian anticlockwise, with Martin & Tim adding Sgurr Coire Choinnichean, at the expense of descent to near sea level before a climb back over the mam Barrisdale. Chris strode off for a solo romp over Meall Buidhe and Luinne Bheinn, but the most impressive adventure of the day was Alan and Fiona's epic 12 hour round of Ben Aden, Sgurr na Ciche, Meall Buidhe and Luinne Bheinn. Despite much snow in evidence on summits to the east (around the Ben especially) there were only a few avoidable sugary patches encountered and only Tim carried a (fortunately light) axe around for the first day (there to be no chances taken on his mission to reduce the remaining Munro count to 4). Several members opted for innov8 style lightweight footwear. Ticks were abroad in abundance, with ten or more being plucked off Antti. Potential Saturday night kitchen chaos was averted by a communal meal (thanks to Martin for curry, Claire for nan breads, Pauline for bhajis... and everyone else who contributed something). while it was clear (in preference to a re-visit of Meall Buidhe), returning over Luinne Bheinn. Monday, of course, the meet had a deadline imposed by the boat (4pm). Sgurr a'Choire-bheithe on the White House's doorstep offered some obvious and easy amusement for most members for a few hours, while Claire and Antti headed for a local Graham. A few scraps of cloud blowing through on a cold wind bought out the first comments of the weekend about bad weather... despite it still being fantastic by Scottish standards. However these activities were mere rambles compared with Chris and Katrina who'd set themselves the task of bagging the prized Ben Aden. With the consequences of missing the boat being somewhat unappealing, a 5:30am departure time was set to allow a sufficient safety margin. While the objective and return journey was achieved in good time, it is the understanding of the author that they became separated amongst the boulders within minutes of beginning the ascent proper. While one member simply headed on to the top without much concern, the other probably ascended the equivalent of twice the mountain's height in the process of searching for them, before encountering the other party on their way down. The remaining part of the day was spent in well deserved idleness, although stress levels begain to rise when the boat failed to appear at the appointed hour; it was sighted within ten minutes however. Trip concluded with fish suppers in Mallaig. Note to future organizers of Knoydart trips: Jon Sellar's boat service worked out very well for us; apparently he may be able to take 14 on the boat (a couple more than the White House capacity of 12, but camping is an option).